The canoe is one of the oldest means of water travel. These boats have remained virtually unchanged in design for thousands of years. But don’t let a canoe’s simplicity fool you. As easy as it may seem to leisurely paddle a canoe, a journey can quickly become dangerous if appropriate safety guidelines are overlooked. 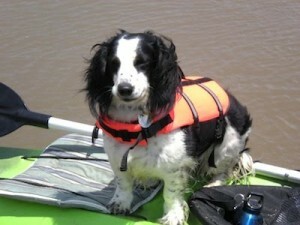 You can minimize your risk of danger by being smart about where and when you canoe. Choose a lake or river that is appropriate for your skill level. Try to avoid high water (it makes a river run faster), high winds and storms. And don’t go out alone — there’s safety in numbers. 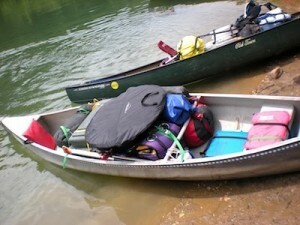 It is recommended that you canoe with a minimum of two boats. When you are paddling a section of a river for the first time you should find out about currents, obstructions like dams or weirs and other information that could effect your safety. It is also a good idea to let a family member or a friend know about your trip and when you plan to return home. A cell phone in a waterproof bag. If your canoe does tip over, don’t panic. Your canoe will float even if its full of water, and you can wait until you can get to shore to empty it. Stay with your canoe and paddle or push it toward the shore. 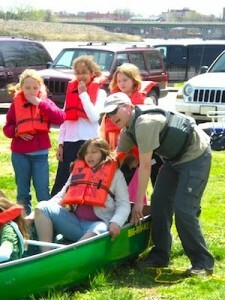 When you get to shallow water, flip the canoe with the help of another person and carefully climb back in. The Kaw is a safe river at low water levels for novices and families; however, it is important to stay away from Bowersock dam and the low water notches of the Topeka and I-435 coffer dams because of the “hydraulics” . When water falls straight down, it creates a continuously circulating current that spins backward. Large hydraulics like the ones below low water notches of the dams are called keeper holes because they can keep a person tumbling deep underwater indefinitely. If you should be caught in a hole, tuck your knees to your chest. The river will likely push you down and out of the hole. It is also important to stay away from strainers – stumps or rocks that have caught debris. If your boat is caught sideways to a strainer, LEAN INTO the strainer, usually the river will pull your boat around the strainer but if not you will need another boater to throw you a rope. If you have fallen out of your boat and the river is pulling you toward a strainer, swim aggressively towards the strainer and crawl on top of the strainer. Teachers, parents and educators can find lesson plans and materials provided in the Kids 4 the Kaw, the River Safety Lesson Plan developed for the Teens 4 the Kaw or High School. We encourage everyone who works with youth to help us make sure that everyone has a safe and fun time at the river.